The buzz has intensified surrounding two of IMAN’s most ambitious initiatives to date as we began the one-year countdown until the kickoff of the Martin Luther King, Jr. Memorial and Takin’ It to the Streets 2016. 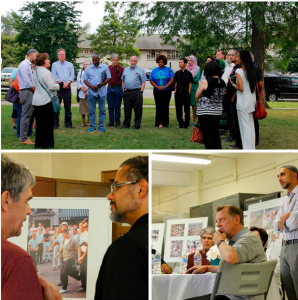 Earlier this month, a diverse group from across Chicago convened at Marquette Park for a discussion and reflection on the memorial. The Chicago Public Art Group shared its preliminary designs with local activists, some of whom actually participated in Dr. King’s 1966 Fair Housing March, and with faith leaders from Trinity United Church, Beth Emet Synagogue, and the Ephraim Bahar Center who offered spiritual insights. Afterwards, the guest visited the proposed location inside the park for the MLK Memorial, closing with a prayer by Father Pfleger of St. Sabina Church. Construction on the memorial will soon begin inside the newly renovated workshop at IMAN’s Youth & Arts Wellness Center, and its unveiling is scheduled for August 5th, 2016. Takin’ It to the Streets, the nation’s most unique Muslim-led urban international festival, will keep the festivities at Marquette Park going on Saturday, August 6, 2016. Marking 50 years since Dr. King’s historic march through that same space, #Streets2016 is shaping up to be the most exciting show yet. Check out the first official promo video below, and stay tuned for big-time updates coming soon! This entry was posted in Arts & Culture, News, One Chicago, One Chicago One Nation, Uncategorized by IMAN Staff. Bookmark the permalink.